December 16, 2009 - The Boeing 787 Dreamliner took to the sky for the first time on Tuesday, ushering a new era in air travel as it departed before an estimated crowd of more than 12,000 employees and guests from Paine Field in Everett, Wash. The flight marks the beginning of a flight test program that will see six airplanes flying nearly around the clock and around the globe, with the airplane's first delivery scheduled for fourth quarter 2010.The newest member of the Boeing family of commercial jetliners took off from Paine Field in Everett, Wash. at 10:27 a.m. local time. After approximately three hours, it landed at 1:33 p.m. at Seattle's Boeing Field. 787 Chief Pilot Mike Carriker and Capt. Randy Neville tested some of the airplane's systems and structures, as on-board equipment recorded and transmitted real-time data to a flight-test team at Boeing Field. After takeoff from Everett, the airplane followed a route over the east end of the Strait of Juan de Fuca. Capts. Carriker and Neville took the airplane to an altitude of 15,000 feet (4,572 meters) and an air speed of 180 knots, or about 207 miles (333 kilometers) per hour, customary on a first flight. It was is truly a proud and historic day for the global team who has worked tirelessly to design and build the 787 Dreamliner - the first all-new jet airplane of the 21st century," said Scott Fancher, vice president and general manager of the 787 program. "We look forward to the upcoming flight test program and soon bringing groundbreaking levels of efficiency, technology and passenger comfort to airlines and the flying public." 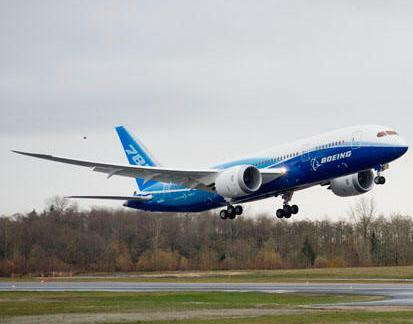 Powered by two Rolls-Royce Trent 1000 engines, the first Boeing 787 will be joined in the flight test program in the coming weeks and months by five other 787s, including two that will be powered by General Electric GEnx engines. The 787 Dreamliner will offer passengers a better flying experience and provide airline operators greater efficiency to better serve the point-to-point routes and additional frequencies passengers prefer. The technologically-advanced 787 will use 20 percent less fuel than today's airplanes of comparable size, provide airlines with up to 45 percent more cargo revenue capacity and present passengers with innovations that include a new interior environment with cleaner air, larger windows, more stowage space, improved lighting and other passenger-preferred conveniences. Michael H. Carriker, Chief Pilot – 787 Dreamliner Boeing Commercial Airplanes. Capt. Mike Carriker is the chief pilot for the all-new Boeing 787 Dreamliner. Carriker joined The Boeing Company in February 1990 as a production pilot and became senior engineering pilot for the 737 in September 1990. In June 1998, he became chief project pilot for the 737 program. In June 2001, Carriker assumed the title of Sonic Cruiser chief project pilot and in that role transitioned to the 787 program in January 2003. Carriker has participated in all Boeing flight test programs since joining the company. For example, he completed more than 500 hours of 777 testing. Carriker served as assistant project pilot for the Joint Strike Fighter program during the design and proposal phases. He also was captain on the first flights of the Boeing Next-Generation 737-600 and 737-900 and first officer for the first flight of the Boeing Business Jet. Carriker also flies the 1933 airliner the Boeing 247D and the B-17F for Seattle’s Museum of Flight, the 1940 Boeing 307 and the Boeing Helio-Courier. He has more than 7,500 flight hours. Before joining Boeing, Carriker was a U.S. Navy pilot, flying A7-Es and F18s. He has more than 300 carrier landings in the A7-E. Carriker is a 1985 graduate of the U.S. Navy Test Pilot School. After a tour as a Navy test pilot, he was an instructor at the U.S. Navy Test Pilot School and an instructor at the Empire Test Pilot School at Boscombe Down, England. In 2002, Carriker received the American Institute of Aeronautics and Astronautics Octave Chanute award for outstanding contributions to aeronautics. Carriker earned a bachelor’s degree in aeronautical engineering from Wichita State University in 1978. Carriker holds type ratings in all current Boeing production airplanes. Randall Lee Neville, Engineering Test Pilot – 787 Dreamliner Boeing Commercial Airplanes. Capt. Randy Neville is an engineering test pilot for the all-new Boeing 787 Dreamliner. As an engineering test pilot, Neville conducts flight tests of new airplane designs, establishing the basic airworthiness of the airplane and verifying that it functions as designed. Before joining the 787 program in 2005, Neville was an F-22 Raptor test pilot for Boeing Integrated Defense Systems for nine years. Assigned to the F-22 Combined Test Force at Edwards Air Force Base, Calif., Neville flew the F-22 as well as the F-16 chase aircraft. Neville was the primary pilot responsible for expanding the Raptor’s flight envelope, or maneuverability capabilities, and in 2004.became the first Raptor pilot to reach the 500-hour mark. With more than 600 hours in the F-22, he is still a high-time Raptor pilot. Neville also was a technical advisor in the making of the movie “The Hulk” and played an F-22 fighter pilot in the movie. Before joining Boeing, Neville flew for 20 years in the U.S. Air Force, with operational tours in the F-106 and F-16. He attended the U.S. Air Force Test Pilot School at Edwards Air Force Base and spent the next 10 years as an Air Force test pilot. Neville conducted weapons development tests on the F-4 and F-16 at Eglin Air Force Base, Fla. His final assignment before retiring from the Air Force was as a T-38 and F-16 instructor and director of Flight Operations for the U.S. Air Force Test Pilot School. Neville earned a bachelor’s degree in electrical engineering from the University of Tennessee in 1975 and a master’s degree in international relations from Troy State University in 1989. Neville holds type ratings in all current Boeing production models. He also has a glider license and more than 6,000 hours flying time in 75 different types of aircraft. Neville is an Associate Fellow in the Society of Experimental Test Pilots, and in 2005 he was awarded the society’s prestigious Iven Kinchloe Award for outstanding professionalism while conducting flight tests.